The Mayor of London has launched a new £1.5 million fund aiming to increase the current proportion of London’s land area under tree canopy by 10 per cent by 2050, with a view to London being the world’s first National Park City. More than 40,000 new trees are on their way to parks, playgrounds, estates, schools and community spaces across London as part of the Mayor’s ambition to make London a National Park City. 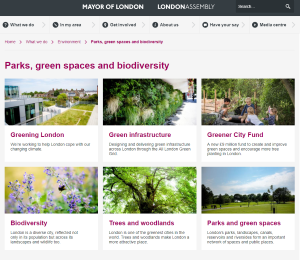 Projects in 21 London boroughs are being funded by the Community Tree Planting Grants as part of the Mayor’s Greener City Fund. Sadiq Khan wants to maintain and expand the capital’s ‘urban forest’of eight million trees which can store carbon, help improve air quality, and create habitat for wildlife. To help increase London’s tree canopy Sadiq has launched a £1.5million woodland fund for boroughs, charities and public sector land owners to create new large-scale woodland for all Londoners and visitors to the capital to enjoy. The Mayor is committed to protecting and improving the green belt and increasing the current proportion of London’s land area under tree canopy by 10 per cent by 2050. Sadiq is also working with partners to co-ordinate a National Park City weekend of mass tree planting across London on the 1 and 2 December. Londoners will be invited to roll up their sleeves and get involved in large tree planting events to create new urban woodlands in parks across London. These include three large projects funded by this round of the Mayor’s Community Tree Planting Grants, delivered by Trees for Cities: Beckenham Place Park in Lewisham, Forest Road Recreation Ground in Redbridge and Montagu Recreation Ground in Enfield. As part of the weekend of tree planting, the Mayor will also make free tree packs available for Londoners, community groups and schools to plant their own trees at home, at schools and in local green spaces. The Mayor hopes tens of thousands of new trees will be planted across the weekend. More details will be announced shortly and people can register their interest online.